The Becknell family from Loveland, CO became extremely concerned when their 3 year old Labrador Retriever started spiting up blood. 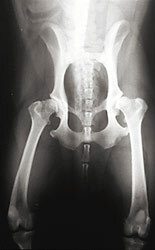 The X-rays from there emergency visit to the vet showed a mass in the dogs stomach. After reviewing the X-rays with family they agreed it was probably an old remote that they had been letting the dog use as a chew toy. The Vet gave the dog one teaspoon of Syrup of Ipecac and shortly there after the Lab started vomiting up the contents of his stomach. As expected up came the remote but it was just chunks of the remote. The dog had chewed the remote into little pieces and that wasn’t the mass in the X-ray. “The Vet started massaging the dogs belly and it just came flying out of the dog,” said Marie Becknell. I knew what it was right away by the color and shape of it. It was my son’s video game remote. The dog had swallowed the boy’s Nintendo Wii remote controller. “The dog spent the night at the Vet and boy’s punishment for leaving the controller out was two weeks allowance to replace the Wii remote” , said Mrs. Becknell. The dog was fine but the remote had to be tossed. I don’t believe it. I think the wiimote would still have worked. So this kid gets ~$25 a week allowance? Geeze how old is he? I was lucky to get $5 a week when I was 12. These people shouldn’t even have a pet. what idiots let their dog chew on a remote control? let’s talk about the vet bills and how lucky they are their dog is alive. What idiots is all i can say. agreed. parents don’t know how to punish their kids. or their dogs. i would have beat the kid with a belt and take the Wii away from him/her. It is really not the dogs fault as much as it it the parents. They allowd the dog to chew on an old remote. So the people to blame here is the humans involved. Don’t know if I should laugh or feel bad… I’m feeling bad for the dog. Must have hurt a lot!! I’m amazed at the parents in the story, and more so at the comments on this article. First of all, what kind of flaming retard lets their dog chew on an electronic device? Idiots. Second, why the hell should the kid be punished “for leaving the controller out”? It’s not his fault the parents educated the dog to think remotes are okay to chew on, and much less that the dog mistook the wiimote for his toy and was stupid enough to swallow it. And third, you people, why the hell are you suggesting harsher punishment for the kid? I repeat: it was not his frigging fault. By the way, nothing works after being immersed in stomach acid for a while, skeptic. First of all it is the parents fault and yes they are mo-rons. Secondly, you don’t let a dog play with a remote and expect him/her to leave all other remotes alone. Third, the kid should take better care of his toys and he should have gotten a little harsher punishment. These people seriously do not need a dog.